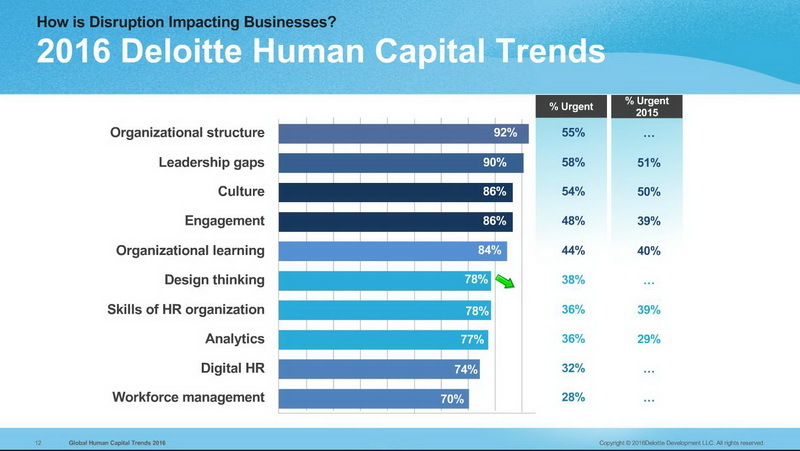 The rate of business model, product, and digital disruption will increase exponentially – leading to urgent reaction on the part of HR to hire in newly skilled talent (digital, analytics, data science, martech and leadership), as well as to stem the flow of significant attrition as Baby Boomers retire in droves, and Millennials shift roles like they were changing their clothes. Organisational structures will be revisited in a dramatic way – old hierarchical and silo’d structures being dismantled in favour of more agile, lean and nimble cross-functional team structures emerging as the core unit of production and innovation. 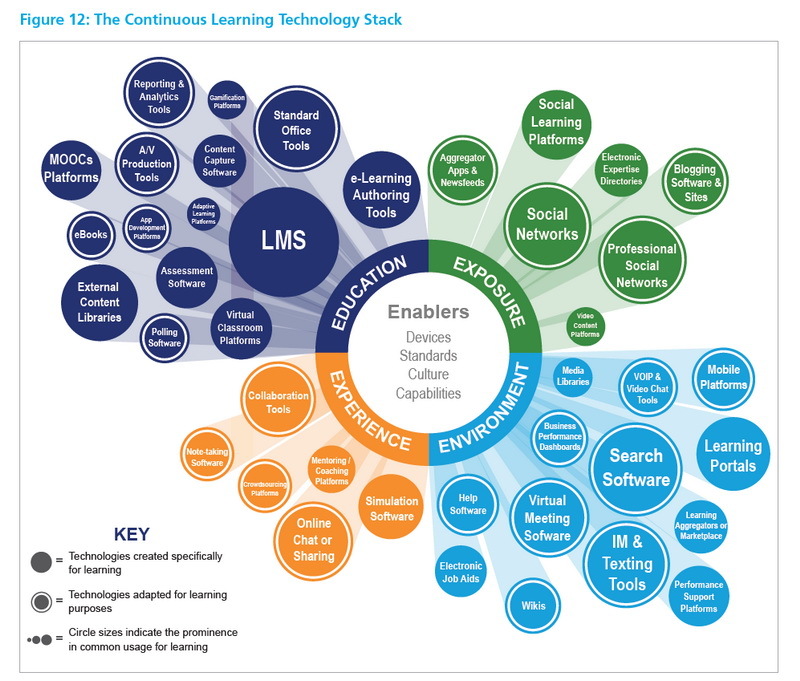 New human capital management skills will need to emerge urgently around digital workforce enablement, people analytics, organizational science & psychology, digital L&D, recruitment, on-boarding, performance management, collaboration, communication and productivity. Culture and employee engagement become concrete factors in increasing recruitment attraction, reducing unwanted attrition, improving productivity and discretionary effort, and driving innovation, sales and delivery performance. Where do I get this from? 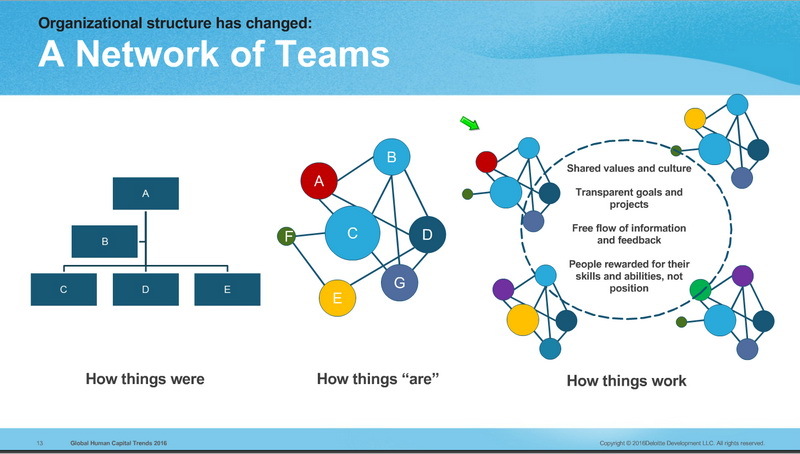 In a very recent webinar with Josh Bersin (Bersin by Deliottes), he outlined in advance of his 2017 survey findings, that 20th century organizational structures (classical hierarchies and top-down management and decision making) is dying – giving rise to devolved decision making by cross functional teams who work in sprints of activity, are funded via micro-budgets and able to deliver at unheard of speeds. Digital transformation is not just shiny new technology – it’s a new way of organizing, engaging with customers and employees, and how we build networks of expertise and trust – through cooperation and collaboration – working faster, better, smarter than ever before. Thus the ‘team’ becomes the ultimate productivity structure within your organization – and HR needs to be right in the middle of this new construct to build out the optimal team design, ensure the right personalities and skills are represented, and to drive new methodologies to ensure the best possible outcomes. This includes team construction, selection, use of psychometric tools, micro-performance management and ensuring trust and collaboration are at the heart of every team development effort. Bersin argues that if HR isn’t supporting the building, optimization, performance, reward and recognition and methodological support elements here – the entire ‘experiment’ is at risk of failing miserably. The other component of this is how HR needs to help the 20th century hierarchy devolve power and decision-making away from the ‘old guard’ who are Baby Boomers that have clawed their way to the top, and now are being asked to hand over their power structures to their best employees. They then need to assume new roles as coaches, mentors, directional indicators and teachers. This isn’t your mom and dad’s old company anymore – the future belongs to the experts and knowledge workers, and leadership needs to shift their perspective to an entirely new way of working. The other issue is the rise of mega-tech companies, who are shifting from Silicon Valley and other core tech arenas to cities around the world – where labour is less expensive, buildings and infrastructure is more readily available, and opportunities will abound for the younger, more tech savvy digital natives. This means that companies like Google, Facebook, Amazon, Netflix, car companies, tech hardware companies and a host of new interlopers will be stealing your talent away in droves – not one at a time. In London alone, Google plans to hire 3,000 new employees in their King’s Cross location, and Facebook another 500 tech employees of every description. Where do you think they’re going to get them from? Yes, you! Thus, what are you doing to attract, recruit, on-board, train and engage the best tech talent in the market to differentiate your company from the likes of Google and Facebook? Best to get busy working on that answer today – as the hunt is already well in play. 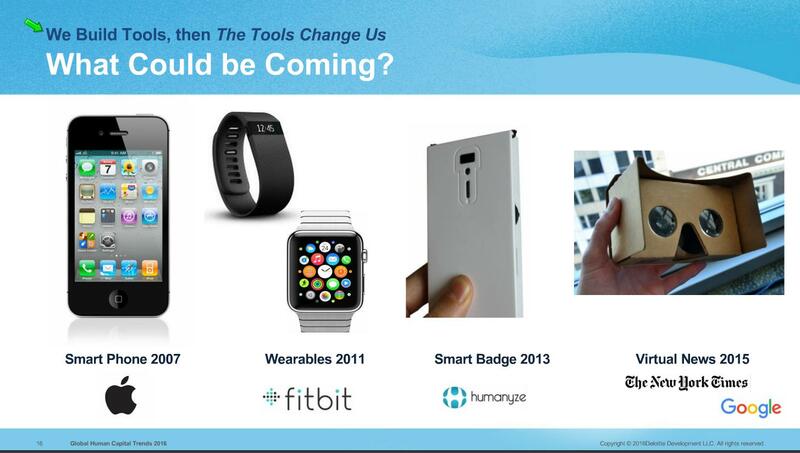 New tools (wearables, mobile apps, digital platforms and VR/AR are all coming to market now with some very credible, tantalizing and powerful capabilities. Where does HR stand relative to these tool sets, how to assess their capability, financial impact, personal impact, data generation, and implementation? Today I’d say HR isn’t remotely prepared for this challenge – and often look to the IT department to support anything ‘technical’ as it’s just not in their remit to sort this out. WRONG! It’s very much in HR’s wheelhouse to address the incorporation of these sorts of tools, and to scrap data off the back end of using them to derive meaningful and actionable insight to improve their business’ ability to compete, differentiate, innovate and build value. So we’ve now gone straight from telling HR leaders they need to become ‘more strategic’ to get a seat at the Boardroom table – to HR needs to be empowering, employing and engaging their working community as if they were an external management consultancy that can explode business potentially exponentially through the use of new tools, new ways of working and new constructs around employee engagement. 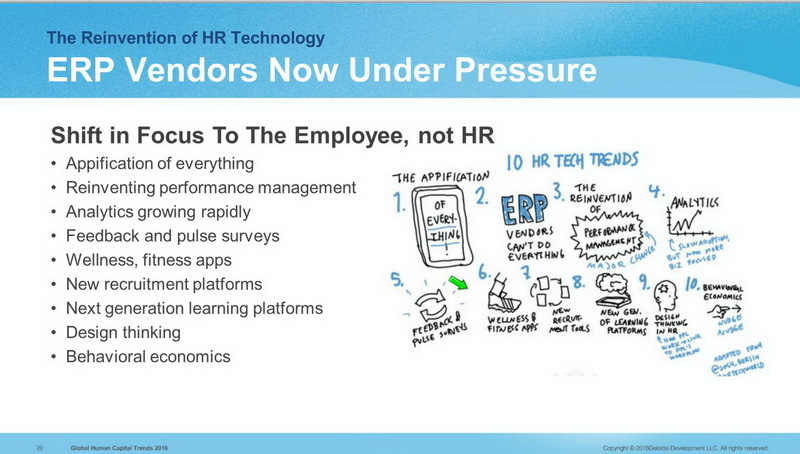 It’s worrying to think that HR leaders are still struggling to find relevance to their businesses – and now technology is leapfrogging the previous challenge, and driving a whole new set of imperatives that, if well adopted and leveraged, will propel their companies into competitive supremacy. If ignored, will lead their company’s path down the route of rapid decline and irrelevance. The shift toward delivering what their employees need to be productive is also another powerful trend. HR teams now need to de-prioritise away from their core remit of administration, compliance and governance efforts by automating, delegating or outsourcing those tasks to systems, managers or 3rd party providers. They need now to jump headlong into creating the environment, structures and tools to support 21st century speed of creation, innovation and collaboration. 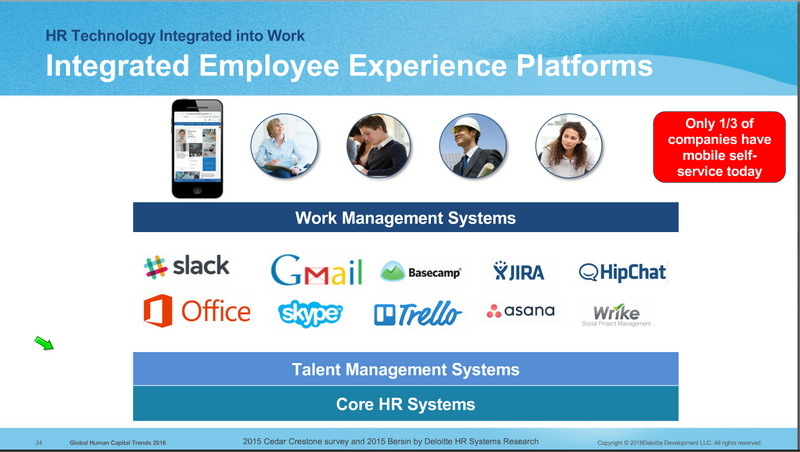 Mobile first applications and platforms that support the bullets in the aforementioned graphic illustrate what HR needs to create and support – tools for the business, capabilities to support their employees on-demand and from any location and to manage change like an everyday occurance. Learning on-demand, just-in-time is another critical enablement feature – and there are all sorts of web-based tools and mobile first applications that can help employees access just what they need to know, when they need to know it. L&D has become a science of mental and psychological enablement – no longer a nice-to-have that makes people feel good about their company investing in them. Learning and performance are closely linked together – and with the incredible expanse of knowledge that employees need to be successful – wherever and whenever they need to know it – is a mission critical advantage now. Organisations need to train one another, provide tools and access across the company, and empower people to succeed under any circumstance imaginable, at speed. The final challenge I think is most urgent for HR is to look at how they are engaging their people – whilst at the same time providing open access to the best, most easily used tools on the market today. I know I feel engaged when my company provides me everything I need to win the day and to achieve my targets. Friday pizza and beer is lovely, and Christmas parties and summer picnics are a sweet thing to do – but they don’t get work done and they won’t be able to make me feel like a champion within my department or team. Great tools provided on-the-go do, and that makes me happy. It also creates a stickiness that supports my staying, and picking my company as the best place to work as it differentiates my experience from the rest. 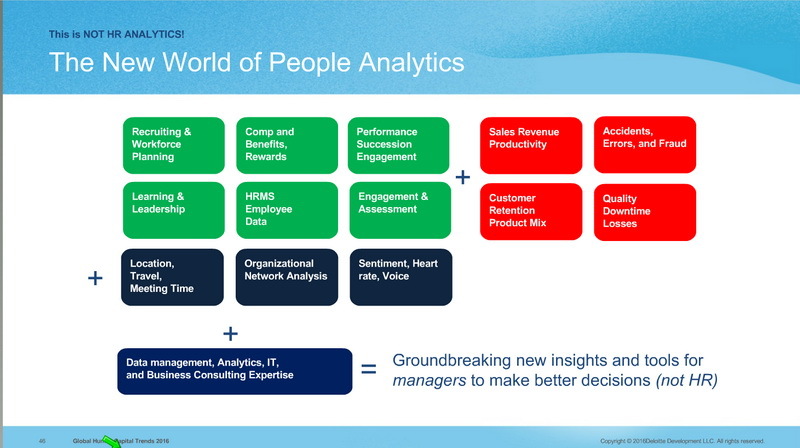 Finally, if HR is truly going to be a powerhouse provider of data insight and actionable decision-making to improve business results – they need to embrace people analytics fully. By taking data from systems across their enterprises (CRM, Finance, Customer Survey), and matching them up with HRIS, performance, pay and training information – the level of insight they can derive to provide clues and patterns that will support market superiority is immense. These are the areas I think we will see impacting HR starting today but well into 2017 and beyond. There is suddenly a rush to digital adoption as senior leadership is realizing how behind the mark their companies are – and often they are turning back to their Marketing, Sales, Customer Care, Product and Development functions to embrace new technology quickly to build differentiation and advantage. HR is in charge of people, process and technology to enable that to happen – and if HR is going to relinquish that role – then I think it’s time to consider a new function called “Work and Productivity Performance” to take HR out of that picture. But as an HR practitioner for over 25 years now – having worked within huge multi-nationals and many start-up high tech companies – I want to see my HR colleagues embrace this moment, own the challenge and push themselves well past their comfort zones to lead the way into the digital revolution – not hide from it and hope it all just goes away (because it won’t, and you don’t want to be seen as the ‘Luddite’ who didn’t see it all coming). Let’s go and grab this moment, own it, make it powerful and effective. We are the function in charge of the people – and we need to become their champions, teachers, supporters and thought-leaders around how to embrace the Digital Age. Jeff Wellstead is a Talent & Innovation Accelerator and Future of Work Consultant for small businesses in the emerging, fast growth high-tech sector, as well as mature businesses under taking digital transformation. His primary focus is on digital transformation & adoption within the talent and human resources function. 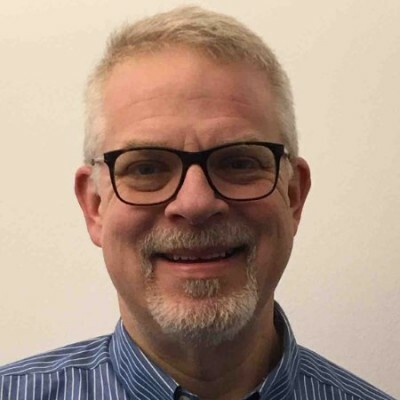 He is a Partner – Digital People Practice at Digital Works Group. You can contact Jeff via e-mail jrwellstead@gmail.com or his LinkedIn page.